Clarets left back Stephen Ward has extended his stay at Turf Moor. The Republic of Ireland international - fresh from scoring a wonder goal in Saturday's opening day victory at champions Chelsea - has agreed a deal running until June, 2019 with the option of a possible further 12 months. Ward, 31, has been at Burnley since August, 2014 and is happy to be staying at a club where he is clearly enjoying his football. “It’s great and long may it continue,” said Ward, whose stunning goal against Chelsea last Saturday helped secure a thrilling 3-2 win over the champions at Stamford Bridge. 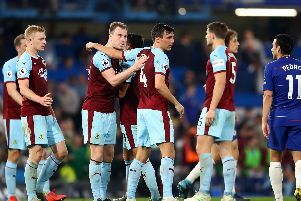 But the defender claimed a starting place half-way through the season, with his return coinciding with an unbeaten run to the end of the campaign as Sean Dyche’s side bounced straight back to the Premier League as 2016 Championship winners. His existing contract – signed in October 2016 – was due to expire at the end of the current season.